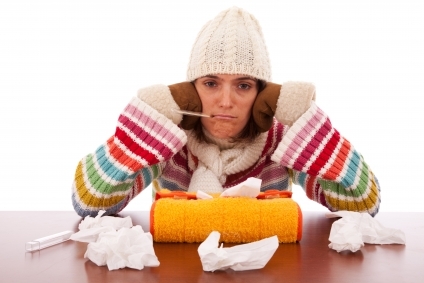 Influenza which is more commonly called the flu, is a viral infection. The flu virus which causes the disease belongs to the family of Orthomyxaeviridae. Unlike plants and animals who use DNA, these viruses use RNA as their genetic material. RNA is less stable than DNA which allows the virus to mutate and change its molecular makeup very fast. Viruses from this family can infect birds and mammals. The most widespread viruses that cause human disease are in the group of the Influenza A viruses. Most of the common seasonal flu viruses, the bird flu H5N1 virus, and the H1N1 swine flu virus that has emerged early this year, belong to this group. What are the symptoms of an infection with the flu? The symptoms of an infection with an influenza virus usually start within one or two days of infection, and the feeling of being ill can begin rather abruptly. The first signs are usually a chill, and a fever of at least 100oF. The fever can become quite high and is one of the signs that differentiate an infection with the flu virus from the common cold. Other symptoms are headaches, muscle aches, joint aches, a general feeling of being ill (malaise), runny or stuffy nose, coughing, and sore throat. An infection with the flu virus can also cause nausea and vomiting, but that is less common. The disease is usually mild to moderate, but it can be severe and even cause death in some people, especially in high risk groups (small children and the elderly, and people with underlying health conditions). People with the flu are usually contagious up to 24 h before the first symptoms appear and for at least 24h after the fever has subsided. Since children have usually not as well developed immune responses to the virus as adults who have been infected with flu viruses many times before, children shed more virus than adults and are therefore more contagious. Viruses are shed by coughing and sneezing in the form of little droplets that can stay in the air and form an aerosol. Inhaling droplets of this virus-containing aerosol can lead to an infection. How long the viruses can survive in the air depends on the humidity of the air and the amount of UV radiation with both factors being favorable for the survival of the flu virus in winter (relatively low humidity and sunlight). Flu viruses can also survive outside of the body on surfaces like door knobs and light switches, or even banknotes and coins. From there they can get transported via hand-nose, hand-eye or hand-mouth contact to mucus membranes that can be infected directly. Swine flu pandemic outbreak in UK again - even though 70% pf patients were vaccinated last year!